Do you recall a couple years back when Rat Queens artist Roc Upchurch was arrested for beating his wife? Writer Kurtis Wiebe removed him from the title and brought in Tess Fowler, who readers seemed to eagerly embrace. However, Wiebe had apparently been going behind Fowler's back to try to get Upchurch back on the title, and Fowler ultimately left, disgusted with the whole situation. The comic went on hiatus at that point in mid-2016, and finally returned in March, this time with artist Owen Gieni and no mention of Upchurch. 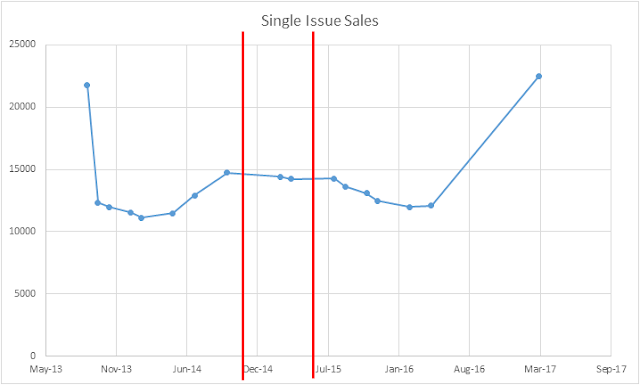 With the sales numbers of the new issue in (thanks to John Jackson Miller) I thought it might be interesting to look at the sales numbers over the course of the entire series... You can see the debut started north of 20,000 -- respectable for the first issue of an unknown IP -- and then dropped to the mid-to-low 10,000 range with the second issue, as would be expected as a more-or-less typical first-to-second-issue dropoff. There's then a gradual decline for a few months before word of mouth seemed to start driving sales up towards 15,000. The first red line then marks when the Upchurch news broke in early November 2014. Sales remained flat over the next two issues, presumably because Wiebe did note fairly soon after (certainly before the next issue came out) that Upchurch was off the series. The second red line then separates the Upchurch-drawn issues and the Fowler-drawn ones. You see the standard issue-to-issue decline with Fowler, with the last data point jumping to its highest with a new Gieni-drawn #1. Now it appears Upchurch's initial arrest halted the upward trend the series was on. But none of the subsequent drama seems to have impacted sales at all. It's certainly possible all those people who stood in solidarity with Fowler and her poor treatment did indeed drop the title, and the increase are all completely new readers. Here's the same chart for the first volume of the trade paperback... There's a different dynamic here than individual issues. In the first place, because it's the same book, the month-to-month sales are all different people rather than the returning readers with the single issues sales. Also, the first TPB is drawn only by Upchurch. 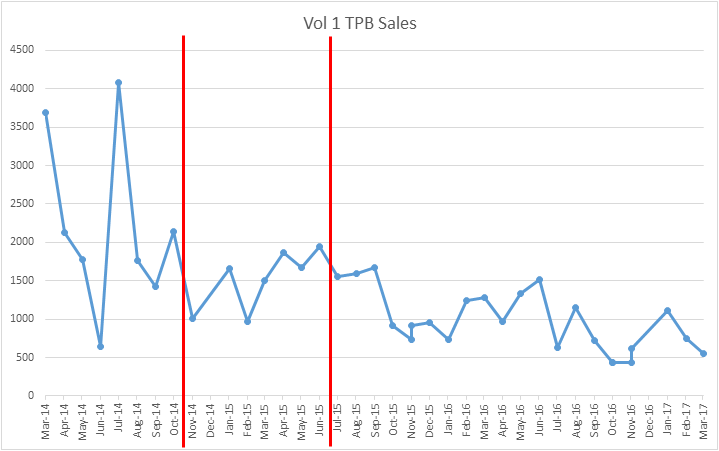 There is a drop after his arrest, but ultimately remains relatively level (the second volume was released during this period); there in fact seems to be a more sustained drop on Volume 1 sales after Fowler started on the single issues, even though she had nothing to do with this volume. Coincidence? It seems, then, that blatant, obvious, and outwardly illegal misogyny does have an impact on immediate sales, but not long term. Nor does the more subtle dismissiveness of going behind a female creator's back seem to have any impact at all. My reading of this is cynical. I see this as readers responding to the Upchurch's arrest, but not the reason he was arrested. If someone has better reasoning that doesn't come across as almost anti-feminist, I'd love to hear it!